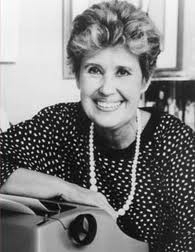 Next week is Erma Bombeck’s birthday. She would be 86 if she were alive today. When I tell folks I write a column, they ask what kind. I say, kinda like Erma Bombeck’s. Some folks immediately know who I am talking about, but some don’t know who she was. This Valentine’s Day I will attempt to pay tribute to the woman whose typewriter ribbon I am not worthy to change, who inadvertently taught me how to write, how to laugh, how to parent and how to appreciate what was most important in life. If you want a glimpse into the life of an ordinary American housewife in the ‘60’s and ‘70’s, crack open one of her many books. She covered it all: the mystery of the lost sock, leftovers, teenagers and growing old. The ‘60’s were hard times, families were in crisis, it was the time of the generation gap, and this woman stood in that gap and managed to appreciate the next generation with all of their quirks and hang-ups. Our mothers and grandmothers read Erma Bombeck, related to Erma Bombeck and appreciated that some woman out there was writing about their experiences which on a bad day seemed so insignificant. Erma was prolific. At its height, her column, “At Wit’s End”, was running three times a week in 900 newspapers around the country. Her column ran from 1965 to 1996, the year of her premature death. She wrote 15 books, many of them best sellers. She appeared on Good Morning America and other television shows. Unfortunately, I was that kid. I used “Everybody else’s parent” all the time. I hope my mom got some comfort from Erma’s words. My kids not so much, but I am a veteran now of “verbal combat”. But mostly, given another shot at life, I would seize every minute… look at it and really see it… live it… and never give it back. Stop sweating the small stuff. Don’t worry about who doesn’t like you, who has more, or who’s doing what. Instead, let’s cherish the relationships we have with those who DO love us. To be honest, however, I will have to admit that I wrote the book for the original model — the one who was overkidsed, underpatienced, with four years of college and chapped hands all year around. I knew if I didn’t follow Faith’s advice and laugh a little at myself, then I would surely cry. These few lines helped me in that when I wanted to cry over my circumstances, instead I picked up her books and laughed, but I cried too, and I laughed and cried at the same time. You see, so many of us who are raising kids or caring for others feel totally overlooked and invisible. Erma, while just talking about her own experiences, shined a light on all of us who take care of others, whether we are moms, dads, caregivers, teachers, etc. She appreciated what she did and it spilled over to all of us. She wrote a column about Edith Bunker. Edith Bunker was the longsuffering wife of that loud mouth Archie from All in the Family. Erma was sad that there were few Edith Bunkers in the world – few folks who listen, who look you in the eyes, who care about what you are saying instead of thinking of what to say next, someone who really hears. I don’t know if Erma was that much like Edith Bunker, I can’t see her taking too much of Archie’s crap, but I do think she listened and was attentive to what her readers wanted. Thank you, Erma, for all you did. I agree with your sentiment to your kids in the dedication in Aunt Erma’s Cope Book, “If I blow it raising them…nothing else I do will matter very much.” I think most of us raising kids would agree. LOVE this tribute to Erma and motherhood! As if “funny” was not enough, Erma was prolific, and often profound. Thank you for a superior article on a fine lady. Erma was philosophically profound and highly entertaining and, Donna Fentanes, you are not to shabby yourself! Erma still is one of my favorite writers ever. Period. Love your tribute to her!